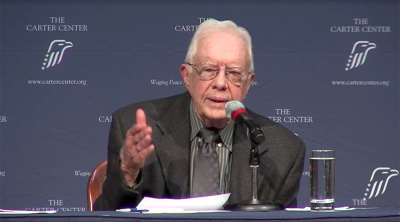 Former US President Jimmy Carter said the US works more like an “oligarchy than a democracy,” while also lambasting Trump’s “hopeless” approach to solving the Israel-Palestine issue, and the increasing tension with North Korea. The former president was speaking at a ‘Conversation with the Carters’ event at his Carter Center in Atlanta on Tuesday. He said money in politics is what makes the US more like an oligarchy – run by a small group of rich people – rather than a democracy, AP reports. Carter said he would send his top person to Pyongyang immediately, adding: “If I didn’t go myself.” The former president visited North Korea three times between 1994 and 2011. “Until we’re willing to talk to them and treat them with respect as human beings, which they are, then I don’t think we’ll make any progress,” he said. Meanwhile, Carter said he doesn’t think that Trump can bring peace between Israel and Palestine. Featured image is from The Carter Center / Facebook.